Long Island Glass Repair | Fogged Glass Replacement, Skylights, Greenhouses, Sunrooms, Storefronts | Creative Glazing Inc.
Glass isn't just protection from the outside world. Its not just a bug blocking, wind guarding, sunlight sharing, moonlight viewing,arrangement of heated sand. It's one of the oldest inventions of craftsmen in a successful attempt to make people's lives more comfortable. 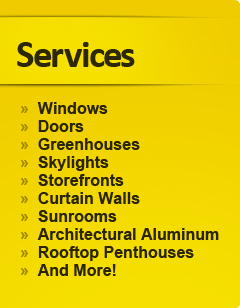 So when choosing a craftsman, choose Creative Glazing Inc.
- New Location, Same Great Service!!! Come see our new Storefront. - Scanned some old pictures. Check out our galleries!